Groundhog Day falls on February 2 and that was certainly the case for Raith Rovers yesterday as a depressingly familiar story saw them drop another two points from a winning position. A thoroughly fed-up John McGlynn even gave his best Bill Murray impression as he lamented over how sick and tired he is becoming of saying the same things every week, before adding: "I don't have the answer to it". As has been the case too often this season, Rovers took the lead in the first half, failed to build on it in the second, allowed their guard to drop, and were then floored by a sucker punch, on this occasion delivered by one of the club's former heroes. Forfar had barely threatened in the second half, but the failure to defend a long ball four minutes from time allowed John Baird the chance to have a strike on goal, and there was a sense of inevitability as it nestled in the back of Rovers' net. It not only cancelled out a stunning opener from debutant Jamie Barjonas, but also all the good things about the performance, of which there were several. The inability to keep a clean sheet remains the team's Achilles heel, and a problem still to be addressed by the management team, with a change in goalkeeper bringing no change in fortune, despite Dean Lyness making a decent impression on his debut. His goal aside, Rangers youngster Barjonas had a positive impact in midfield, bringing composure and creativity, while Tony Dingwall was a deserving man of the match having been at the heart of Raith's best attacks, also without shirking away from the dirty side of the game. Despite some impressive saves in recent weeks, goalkeeper Robbie Thomson was the victim of last week's defeat to Brechin, as was winger Nathan Flanagan, as both players dropped to the bench. Rovers almost conspired to gift Forfar a fifth minute opener when Barjonas appeared to wrong-foot Iain Davidson with a pass back, and with the defender slow to react, Dale Hilson was presented with a clear run on goal. Fortunately for the home side, the forward's finish was weak and Lyness made the save, but had he squared the ball to the unmarked Baird, the visitors would have surely taken the lead. Forfar's confidence from a four-game winning run was evident in the opening half hour, during which they won eight corners, with Lyness also required to make an excellent one-handed save to tip over a shot from Darren Whyte. At the other end, Rovers were playing a fluid shape, with Barjonas and Dingwall given licence to drift infield, and full backs Murray and Crane encouraged to get forward, and it led to some flowing football that was just missing a final product. Barjonas supplied that in the 33rd minute with a goal of the season contender. Stepping onto a pass from Dingwall 25 yards out, he thundered a stunning shot that drew gaps from the crowd as it flew into the back of the net via the inside of the post. Rovers had chances to put the game to bed after the break - Kevin Nisbet headed wide from six yards, while Marc McCallum made good saves from Barjonas and Chris Duggan. A chance was also wasted when Barjonas and Dingwall appeared to get in each other's way. There was also a nice move that ended with Crane surging into the box and sending a low effort across goal that missed the far post by inches, while substitute Liam Buchanan's cut back found no takers with the goal gaping. 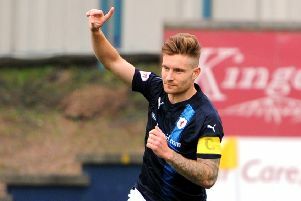 A second goal for Raith would have been deserved on the balance of play, and it would have put the game to bed, however, the failure to do so came back to haunt them when, with four minutes left, the self-destruct button was pressed with the defence caught out by huge goal kick from McCallum. What should have been a simple ball to clear was misjudged by both centre-halves and as it bounced through to Baird, he rattled a volley into the top corner from the edge of the box, leaving Lyness helpless, and Raith's current first choice back four still searching for their first clean sheet. If that was a sickener, what followed a minute later was even harder to take as Raith somehow contrived to miss an open net, Crane's cut-back finding both Buchanan and Murray racing in, but neither could force it over the line, with Murray appearing to get the ball stuck under his boot. The full-time boos reflected the frustration felt by everyone that a mostly positive performance could lead to such a disappointing outcome. Whether it be personnel, tactics, or an overall mentality - and you could point the finger at all three - it's clear Raith are lacking the required qualities to win games consistently at this level. McGlynn may not yet have the answers, but he will not need anyone to tell him that promotion this season depends on it.